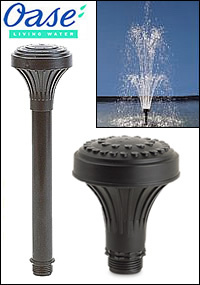 The "Vulkan" Fountain head is a three-tiered fountainhead nozzle with 31 separate jets that can create a fountain display that sprays up to 5 feet high with a 770 GPH pump (pump not included). Oase Vulkan 31-1.5k fountain jet makes the ideal fountain attachment for the pond keeper who is looking for a tall slim fountain jet. This robust plastic fountain jet can simply be added to most threaded outlet pond pumps. The pump is not included.